Address: 1077 Budapest, Baross tér 15. 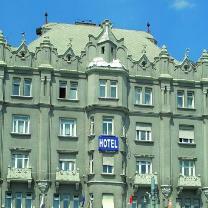 Hotel Baross is an inexpensive three star accommodation in the centre of Budapest. Just minutes from Keleti International Railway station, in a central location, with excellent transportation access. The building that gives home to the pension was built at the turn of the 19th century and had long functioned as an upper-scale residential apartment block. The hotel occupies the top two floors; the rest of the building accommodates businesses and residents.A separate panorama-elevator was built exclusively for the use of the guests of the pension. Following the total reconstruction of the building we have opened our three-star Hotel that offers fourty rooms and one suite. Budapest Hotel Baross has 40 rooms and 1 junior suite. Among these rooms you can find singles, doubles, triples and quadruples. For those arriving with a car, we offer a secure parking lot nearby. The breakfast room offers you delicious all-you-can-eat open buffet table every morning to help you with starting a good day! Our goal is to provide the very highest level of comfort and the best value for money. Our modern facilities and furnishings, plus our helpful and knowledgeable staff will hopefully contribute to a truly memorable experience in Budapest - once you will want to repeat. M2 (red line) Keleti pu. Bus stop #7, 7A, 78, 73, 173 at Keleti pu.